Dough Bakery, one of the two vegan bakeries here in Atlanta just had their first anniversary and celebrated by co-hosting a pot luck with the wonderful Veganadian. There were about 25 or 30 people there and everyone pulled out all the stops to show off their vegan cooking skills. 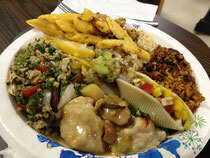 There was everything from mac & cheese, to peanut butter tofu, to homemade vegan cheese to vegan chicken & dumplings. Everything was delicious. We made the squash casserole from Cookin’ Crunk. Our CSA has been inundating us with squash and we were having a really hard time using it all, so this made perfect sense. The casserole is a squash & rice dish that uses vegetable broth and non-dairy milk so achieve a creamy goodness. It turned our really well and even people who said they didn’t like squash said how much they enjoyed it. Dough provided cake for desert and there were samples of vegan gelato from Revolution Gelato, too. I was so stuffed it was just silly. After we ate, there was a raffle of a lovely gift basket and everyone voted for our favorite local animal charity to get the proceeds. The lovely Veganadian also had a little gift for everyone to take home – a ceramic keychain from Jeannette Zeis Ceramics, and a bag of coconut bacon from Phoney Baloney!